If you are trying to decide on a dog breed that fits in with your lifestyle it requires you to consider many factors, not least of which is how much time or inclination you have to exercise a dog. In this day and age many of us lead very busy lives, and finding time to walk an energetic dog is not always a viable option. 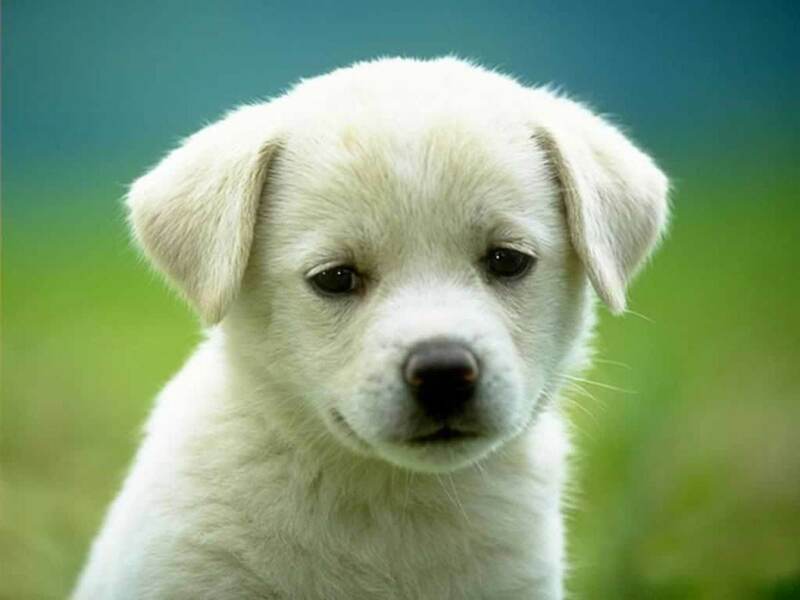 If you are reading this hub I assume you have already been sensible enough to consider this before going out and buying or adopting a totally unsuitable breed, and have instead decided you need to find a breed that won't need much exercise, but will still make a great family pet or personal companion. You have probably had lots of suggestions already made to you, and it is true to say that for many reasons a lot of dogs will not require as much exercise as others, e.g. older dogs, toy breeds, disabled dogs etc. But whilst it is a great option to give any of those dogs a home, (and I fully endorse the idea), what if what you really want is a fully healthy, youngish dog that is not too small, but will also not need too much exercise. Enter the Greyhound! Okay, right now most of you are probably reeling backwards and making disbelieving noises, after all, haven't you seen Greyhounds sprinting around dog tracks at speeds in excess of 70 km/h? Well, it is true that Greyhounds do reach incredible speeds, and that they were bred for hunting originally, but what most people do not know is that Greyhounds are actually one of the laziest dog breeds you could ever take on. Essentially they are much like a Cheetah, they can cope well with short bursts of speed, but when it comes to stamina they are somewhat lacking and would rather be curled up by a nice fireplace or on your bed! Sadly Greyhounds are often given a very bad press. People mistakenly believe they will need hours of exercise every day and that they will naturally chase and kill cats and other small creatures. I have owned a Greyhound and have known many more over the years, especially through my time working within veterinary practices. 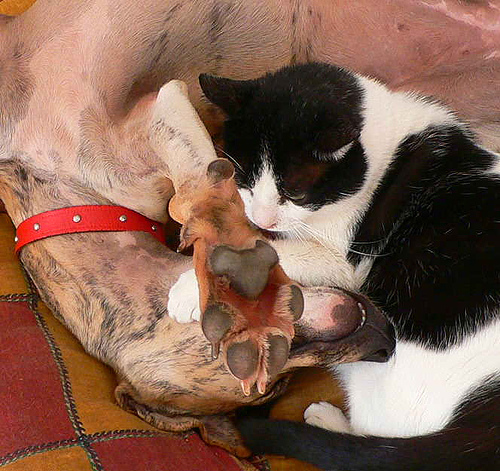 It is fair to say that you will find some Greyhounds that try to chase cats and other creatures, but usually these tend to be ex-racing Greyhounds. The problem can be solved by placing them in a muzzle when they are out in public places, but make sure there actually is a problem before you assume the worst. See how they react around cats and other pets, and if you are planning to adopt an ex-racing Greyhound, the rescue organization should be able to advise you of how the dog has behaved when it has been introduced to other creatures. 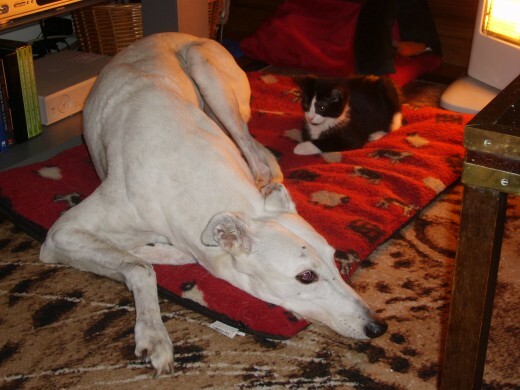 As you can see from the photo that heads this article, my own Greyhound had no issues with cats at all, and in fact she would happily snuggle up with the cats on my bed and never even considered chasing them, (to be honest she was quite subservient to them and they ruled the household). The main misconception is that Greyhounds will need constant exercise and are high maintenance dogs because of this. This couldn't be further from the truth, especially as a Greyhound is one of those breeds that you virtually have to haul out of their beds in order to get them to go for a walk. When you do take them out for a walk they are perfectly happy to come home after half an hour, immediately returning to their dog bed, (or your bed given half a chance) and settling down with an expression of complete contentment all over their faces whilst looking up at you lovingly with their huge 'Bambi' eyes. There are quite literally thousands of Greyhounds that have served their time on the racing tracks and now need good homes. They are still young dogs, and all they crave is love, a warm bed, some nice food and a short walk every day. In return they will give you the love back tenfold, show your children and grandchildren just how gentle they are, and will be forever grateful that you gave them a loving home. Even if you don't take on an ex-racing Greyhound, there are plenty of Greyhounds that didn't 'make the grade' and never raced, but still need a human family to take them in and love them. Please please don't ever be put off adopting a Greyhound because you think you will spend the rest of your life walking it, or because you believe they are likely to be aggressive towards cats. This couldn't be further from the truth and I am certain you will not regret giving a Greyhound a home, not least because of the many comfortable hours you can spend being 'couch potatoes' together. Just one example of how lazy Greyhounds actually are! Did you know that Greyhounds needed very little exercise or was it a surprise to read this? If you are looking for a dog which requires little exercise would you now consider a Greyhound? If you have owned a Greyhound would you agree they need very little exercise? If you have owned a Greyhound would you agree they make great family pets? This article provides a list and descriptions of lazy dog breeds. Thank you Audrey. I too love dogs and wish we were allowed to have them where we rent now. Greyhounds are especially gentle and lazy, so it makes them ideal pets for those who can't walk far themselves or who have a busy work schedule that makes it difficult to walk a dog that requires a lot of exercise. Misty is correct - all dog breeds don't need a lot of exercise. I've handled, trained, owned, and bred many breeds. There's a big difference in NO exercise/stimulation and A LOT of exercise/stimulation. Case in point: the two Great Danes I currently own. I'll take them out to play and run, and within 15 or 20 minutes, they're sitting at the door, ready to go back inside. And, by the way, they're both in great shape - physically, mentally, and emotionally. It's also interesting to note that Danes have Greyhounds in their bloodlines. Greyhounds were used to make the bulky German mastiffs slimmer and leggier. Wonderful hub, Misty! Voted up! Thanks jandee, my Doberman puppy was brought up with a Boxer puppy, and I certainly saw character traits picked up that were funny, e.g. using paws a whole lot when playing. Boxers are my half sister's favourite breed, and I do love them as well. Unfortunately that's why a lot of dogs are abandoned too. People love the look of the breed and hate the disposition. I love sight hounds personally, but it's not their looks I'm into. I think their personalities are phenomenal. 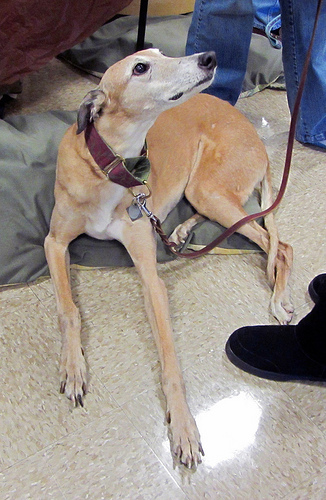 One of the sweetest dogs I ever met was in a pub in Cornwall -- a Saluki-Greyhound mix. She was just so *sweet* that it's unbelievable. That is such a shame Everyday Miracles, so many people are influenced by what a breed 'looks like' when they choose, yet what they should be looking at is the disposition of the breed, (btw I love Rotties too, and have known loads of them, never met a bad one yet). I would love to have a greyhound. Sadly my husband doesn't like the "look" of the breed. We love our lazy Rottweiler though! LOL Kelly, well the dog variety can sure run fast, just not for long and then they want to rest. Our Greyhound Lady would do about 6 laps of the outside of our farmhouse, (when my late Hubby was alive we rented a large farmhouse with about 2/3 acre of 'fenced land') and then she would crash out on the lawn or in the lounge and want to sleep. When my Hubby died I brought her and my terrier back home to Guernsey, and it was funny how she would refuse point blank to get off my bed. She lived with my parents for a couple of years when I went to Tenerife, and when I returned she would come and stay with my next Husband and I when my parents were on holiday. 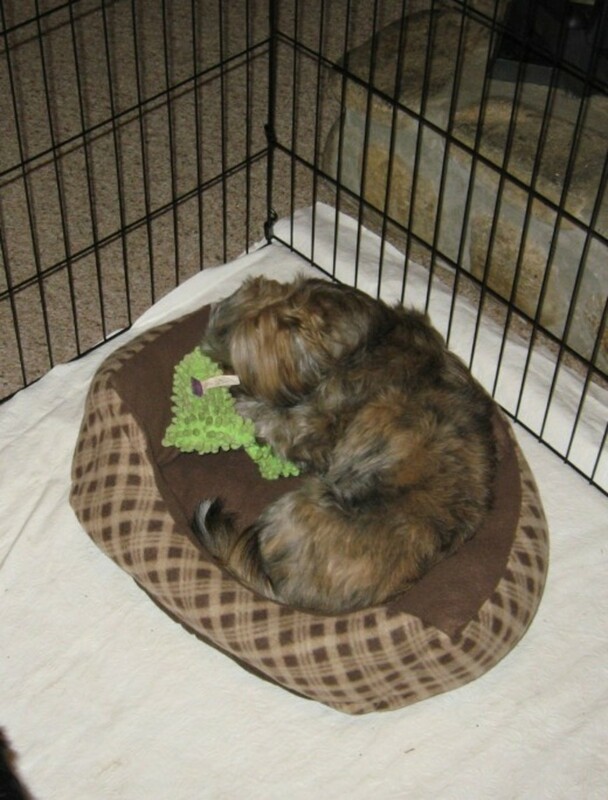 My second Husband found it hilarious that he would try to lure her off our bed with treats so he could take her for a walk, but she would grab the treats and immediately bound back on to our bed and refuse to move. PS. I never suggested not socializing them either, and most Greyhounds love other dogs, often as a result of their time spent in training and racing against other dogs. Our Greyhound loved to go to the beach and we couldn't keep her away from running around at high speed with any other dog she came across. She also had a companion which was a sweet little rescue Cairn cross terrier that had a load more energy than Lady ever had. We used to walk Lady around our fishing lake often, and guess what, halfway around she would usually lay down and leave us to walk off on our own, only strolling after us when she was ready. After about half an hour she would look at us and literally whine, making it clear she wanted to go home. My Step Dad took her on some walks (he loves walking) and she would sit down half way through the walk and refuse to move any further. Sadly your mistaken understanding of Greyhounds is largely why so many of them are killed rather than being re-homed. You too believe the stereotype that they need tonnes of exercise, and obviously you have no real knowledge of the breed. Sorry you took this article the wrong way doberdog. Firstly someone asked the question of what was a good dog to have that needed little exercise and I simply answered it based on my experience working in vet's surgeries and from owning dogs. Many people would love to have a dog, but simply don't have the time to exercise an overly energetic dog. The bottom line is that Greyhounds are inherently lazy, and choose not to do much exercise. You don't really seem to have read this hub if I am honest, because if you had you would have seen that I had a Greyhound, and whilst she was offered lots of walks she always only came with us under sufferance, (and it seemed more to humor us than because she really wanted to.) It is also common knowledge that Greyhounds are a lazy breed, (don't take my word for it, check it out on the Internet and watch the videos too). I have owned other breeds too in my life, (including a very much loved Doberman who needed tonnes of exercise), I have never ever found a dog that needed as little exercise as a Greyhound, they just love to sleep no matter how much you try to walk them. You have been incredibly quick to judge me without even attempting to ask questions or read this properly. That is a great shame, because you clearly have no idea just how much knowledge I actually have on animals in general and their care. Not every dog wants 3 or 4 hours exercise a day, and I NEVER implied that no exercise was required for a Greyhound, (read the title of the article again). Most people do not have 3-4 hours a day to walk any breed of dog, so to suggest that this is what is required for a breed like a Greyhound is hugely incorrect on your part, and based on clearly never having owned one. Wow you are sadly one of the worst people I have ever come across to advocate the ownership of a dog. To tell people that a certain breed of dog is great because you don't have to bother exersising it is just beyond belief! My dobermann has just had an op to remove a tumour and is restricted to very little exercise which he accepts and sleeps for about 20hours a day but given the choice would he soonet spend his time sleeping or tearing around a field for hours or hiking around the local hills for hours? Damn right he would! Truth is virtually every dog will sleep all day if it is offered no alternative but give them the option and they will readily accept loads of exercise - greyhounds included! I meet regularly with greyhound owners who walk 2-4 hours a day to keep their dogs happy and well maintained. Apart from the exercise there is the socialisation to consider - ALLdogs should be well socialised, greyhounds included. LOL Bob, not quite the same as a guinea pig for sure. Usually getting an ex-racing greyhound will not only be cheap, but frequently free because they have so many needing homes. I know people here with five or six of them and they totally adore them. The most you will probably be asked to pay for an ex-racer is the standard donation to the rescue centre in question. Fingers crossed owning a Greyhound will become more popular still, because right now there are still loads of them needing homes, in fact many are now being shipped to Jersey (our neighbouring island)who have a Greyhound Rescue Charity. The charity then advertise throughout the Channel Islands in order to find homes for them. As I expect you know (u don't mss much!) owning an ex track greyhound has really caught on in the UK as they are all you say they are and are cheap to buy, too. I have never had one and, in truth, don't fancy the breed, but for someone without firm preferences a guinea-pig would make a lovely pet...er...you know what i mean! Thanks Brian, sadly there are literally thousands upon thousands of Greyhounds needing homes. I have seen horrible cases such as where they were slaughtered by the hundreds and the bodies found dumped at the bottom of a cliff, some of the dogs were still alive. For such a gentle and beautiful creature this is just appalling. I too really would love to see this article go viral so that many more could get good homes and the retirement they deserve, after all they are still very young dogs when they retire. Thanks Cosmic Bus, I have heard Italian Greyhounds make good pets as well. Cute, and essentially a very small greyhound a little bit like a whippet. Thanks for answering my question! I've always been fond of Greyhounds, mostly because they look so regal and beautiful. Now I know they are perfect couch potato doggies too! Fab, voted up and shared! I don't have a greyhound, but I love the article and the video! Roscoe is part chow and austrailian shepherd mix and he made the choice to be a couch potato when he came home here. And he only likes one side of the couch. I did not know they did not need exercise I thought all animals along with humans needed exercise..
very interesting. I wouldn't mine having one as a pet. Hi Terrinfamily, I hope you do, as they make such wonderful pets and are such low maintenance dogs. Thanks for your feedback. I have always liked the breed and it's a shame they're so exploited by the dog racing industry. I would consider owning one, but, I have my sights on other hypoallergenic breeds once Maya kicks-the-bucket. Voted up and useful and interesting. I was always under the impression that Greyhounds would need a lot of exercise. I always love learning new stuff about different dog breeds. I have Newfoundlander's and they sleep most of the day and night. Thank you for sharing. I'm glad to learn this.